Three years after the Arab Spring, life for ordinary people in Egypt is getting worse instead of better. Poverty levels, which have gone up by 50 percent over the last 15 years, appear to be worsening in the wake of the revolution. Food prices are meanwhile soaring and unemployment, which is particularly pronounced among young people, is likewise on the rise. The quality of education is among the lowest in the world, and adequate housing and healthcare are out of reach for large sectors of the population. All the while, deficient social spending, regressive taxes and an inefficient system of subsidies are exacerbating the problems faced by ordinary households. 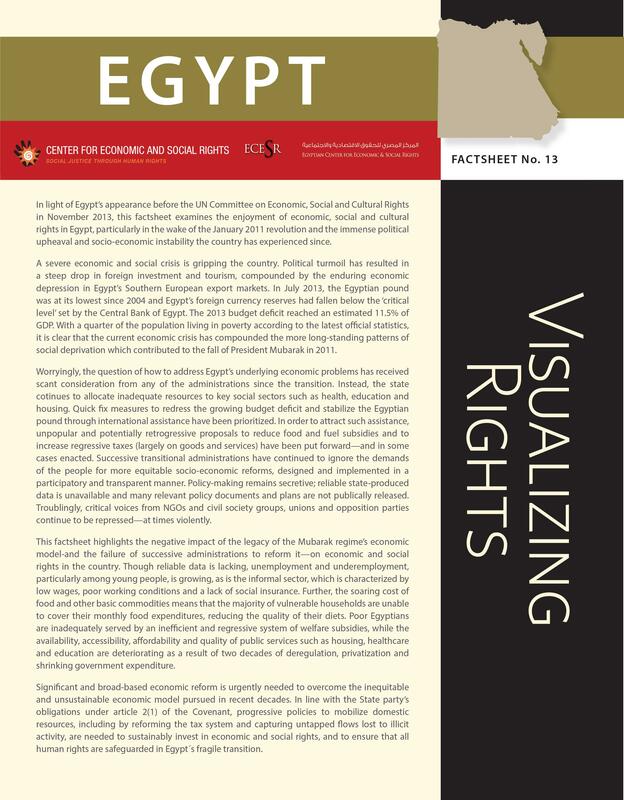 A new factsheet produced by CESR in collaboration with the Cairo-based Egyptian Center for Economic and Social Rights (ECESR) provides a concise statistical snapshot of these worrying trends in economic and social rights in the country. This is the latest in the 'Visualizing Rights' series of factsheets, which has become a valued resource highly praised by both advocates and members of UN treaty bodies for effectively translating complex human rights principles and arguments into simple and compelling graphics that support the demands made by people on the ground. This document, which is available in both English and Arabic, was produced in light of Egypt's appearance before the 51st session of the UN Committee on Economic, Social and Cultural Rights last week in Geneva. It offers a clear graphical illustration of the human rights retrogressions unfolding in the spheres of employment, housing, education, healthcare and living standards. The factsheet complements a joint civil society parallel report, endorsed by some 58 national and international organizations, which was submitted to the Committee in advance of the session. As the North African country continues to navigate a delicate transitional process, this timely document demonstrates the failure of successive administrations to address the social injustices which fuelled the revolution in the first place. Since the historic events of 2011, the Egyptian people have been facing multiple crises, but investment in key social sectors has remained manifestly inadequate nonetheless. As elucidated in the factsheet, the government has instead pursued short-sighted fiscal austerity policies, in the hopes of winning foreign loans, rather than exploring fairer options for revenue generation and taking the necessary immediate measures to protect the most vulnerable groups from the effects of the political and economic crisis. On 14 November, Egypt was reviewed by the UN Committee mandated to oversee compliance with the International Covenant on Economic, Social and Cultural Rights for the first time in over 12 years. Members of the Committee, who had previously been briefed by CESR and its partners, challenged the government over its performance with regard to the obligations set out in the Covenant. Over the course of a full day of questioning, the Egyptian delegation was interrogated over many of the retrogressions illustrated in the factsheet. Most importantly, the Committee questioned whether the country would be able to achieve a sustainable transition without bringing its social and economic policies fully into line with its human rights obligations. In the coming days the UN body will issue a set of concluding observations and recommendations to the Egyptian state. It is CESR's hope that these recommendations will be promptly and fully implemented by the Egyptian government, so as to meet its human rights obligations. We and our partners will continue to work, at both the national and international levels, so as to ensure the long-standing patters of injustice and inequity in Egypt are finally overcome. To download the factsheet in English in pdf format, click here. To download the factsheet in Arabic in pdf format, click here.